Ten years ago, online businesses were booming thanks to a relatively unregulated internet. Whilst many online businesses continue to thrive, many others are falling by the wayside – simply because they cannot find a way to climb the page rankings. And it stands to reason. Many of the early bloomers were using SEO tactics that have since been outlawed by search engines. Subsequently, webmasters have a harder time boosting their page rank because they cannot afford the digital marketing costs. Google algorithms are largely to thank for the decline of SEO companies – or blame, depending which side of the coin you look at poor page ranking. In the last decade, algorithms have become so sophisticated, crawlers recognise tactics designed to manipulate search rankings and punish bad practices with penalties. On the face of it that is true, but more recently, the search engine giant has been introducing new tools and systems that favour corporations that have a large marketing budget in their coffers struggling small businesses do not have. Content continues to be the driver for a website’s page rank. And this is not likely to change anytime soon – which is good or bad news, again depending which way you see it. The rules are simple. Search engines are looking to promote websites that publish quality content and engage readers. Page rank is thus awarded by monitoring the amount of engagement with readers, together with likes and shares through social media networks. What Google is actually looking for is content that offers readers fresh information, new ideas and unique suggestions rather than regurgitating content that has been provided by other writers. This is obviously not the easiest thing to do as unique idea are limited. But that doesn’t mean that webmasters cannot present old information in new ways. All you need to do is consider how to engage readers. Again not easy, but not impossible. At present however, the playing ground is not level. Producing content on a regular basis is time-consuming and costly for small businesses. So too is engaging followers on social media networks. It is easy to see why SME’s do not feel it is worth investing in SEO when they cannot compete against brands with a huge marketing wallet. Furthermore, Google has killed off keywords and page rank, not to mention restricting the type of backlink strategies websites can benefit from. Essentially, anything outside of natural links will be penalised, but if your website is not ranking, how can anybody find it to link back to it. The new driver of page rank is social media – although you still need to produce quality content to engage users. Do you see a catch-22 emerging here!? But do not fret, there is still hope for SME’s. The introduction of Hummingbird has moved search engines robots into semantic text whereby algorithms can intuitively translate the context of content. Although semantic search is still in its early stages, the new algorithm is moving search engines towards recognising genuine quality of content over quantity. Hopefully, Google will really level the playing field and quantify the amount of interaction users have with your content on percentages rather than total visitors. For example, if you post one piece of content a week that gets 100 likes compared to the ten pieces published by your corporate rivals that in total receives 500 likes, you are producing content that is 50% better. The emphasis of producing content your customers want therefore is underscored and will only become more vital in the quest for a high page rank. How you go about producing such content is a story for another day, but the good news is you do not have to blow a huge hole in your marketing budget in order to compete with the big boys. 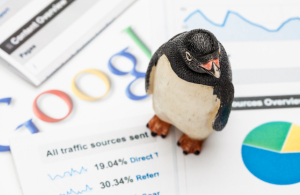 Google Panda – What Does It Mean For Your SEO? We will keep you informed about digital marketing trends, latest news and events. Be the first to receive insights. Move It Marketing provides transparent and effective data-driven organic SEO & paid digital marketing strategy implementation across a range of channels in a transparent and ethical, yet cutting edge manner.